Hudson’s Bay Canada & Estée Lauder Deals: Receive a Six-Piece Gift ($82 Value) when You Spend Just $36.50! Hudson’s Bay has a new awesome Estée Lauder offer right now! 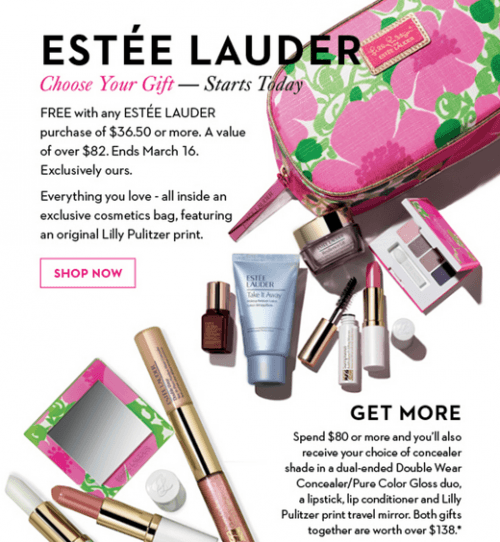 Receive a FREE six-piece from everything you love from Estée Lauder cosmetic plus an exclusive cosmetic bag, featuring an original Lilly Pulitze print on your purchase of just $36.50 or more! Take it away makeup remover lotion. A choice of Resilience lift cream, (lifting/firming) or daywear cream (age prevention) in a deluxe gift size. Pure colour lipstick and pure colour eyeshadow quad in bold or subtle. This Hudson’s Bay Canada & Estée Lauder deal is valid online and in-store from today, Wednesday, February 26 until Sunday, March 16, 2014 only. Receive a FREE $20 Savings Card with any Estée Lauder purchase of $75 or more when you use your Hudson’s Bay MasterCard or Hudson’s Bay Credit Card. Same ol lipsticks! Need new ones to justify prices they charge.